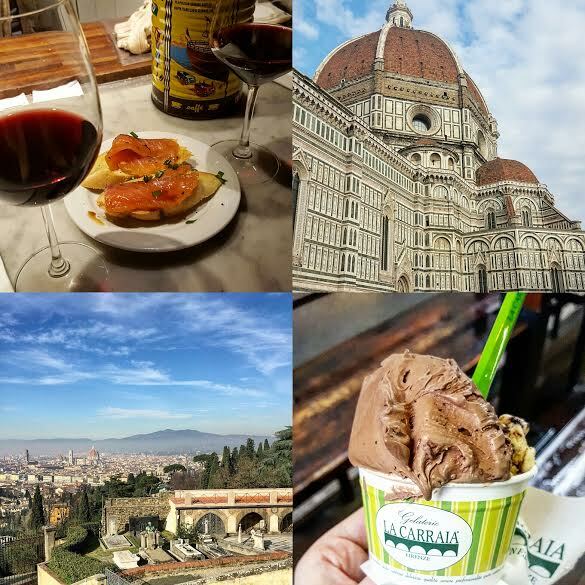 So I thought it was about time I gave you guys some tips for my favourite places or things to do in Florence, I'm not gonna lie, there will be a lot of food and drink places in my list but ya know, sometimes it really is the simplest things in life. There are a lot of gelato places and if you're in the centre I'm telling you now, avoid the places that have the ice cream piled high in giant towers, it's tourist ice cream, so not great. If you're in the centre then you need to visit La Carraia. Hands down the best gelato ever and for a good size cup it's like 2.50€ totally worth it. I go for the cookies and Nutella, need I say more..? Il Santino - This one is a tiny little place but if you can get a seat you are laughing, I would say go a little earlier rather than later, the Italians are always late so you have more chances of getting a seat inside if you go around 7ish. They serve little crostinis with your wine choice depending on what you order will depend on what crostini you will receive, the wine is delicious, the food is delicious, something very rustic and understated about this place. It's right next to a restaurant of the same name but the wine bar is like a little hole in the wall so go an check it out. I'm telling you now, if you want to see something beautiful, go a grab a drink by the river arno in the evening before the sun sets. It's almost magical. I love nothing better than going to get a prosecco and sit along the river, the place I go is Rivalta it's a little more expensive per drink but aperitivo is included so you can fill up on the food they have to offer. This one I have written a review about it's called 'O Munaciello. It's a very traditional pizza place with it's roots from Napoli which is where pizza actually came from. If you're here then you have to have a traditional limoncello to finish the meal. It's delicious. It's a super popular restaurant so make sure you book it a table!! All'antico vinaio is another place I have mentioned before and is easily the most popular place in florence for their sandwiches, just look at the reviews on trip advisor. The thing that I love about this place is that one shop just sells sandwiches and the other just sells platters of meat, I mean, you can't go wrong. There is a queue for the sandwich place but I'm telling you now it's worth it and they are huge!! If you can get a seat in the other place then snap it up, again I would say go a little earlier to beat the Italian rush or try and book a table in advance. 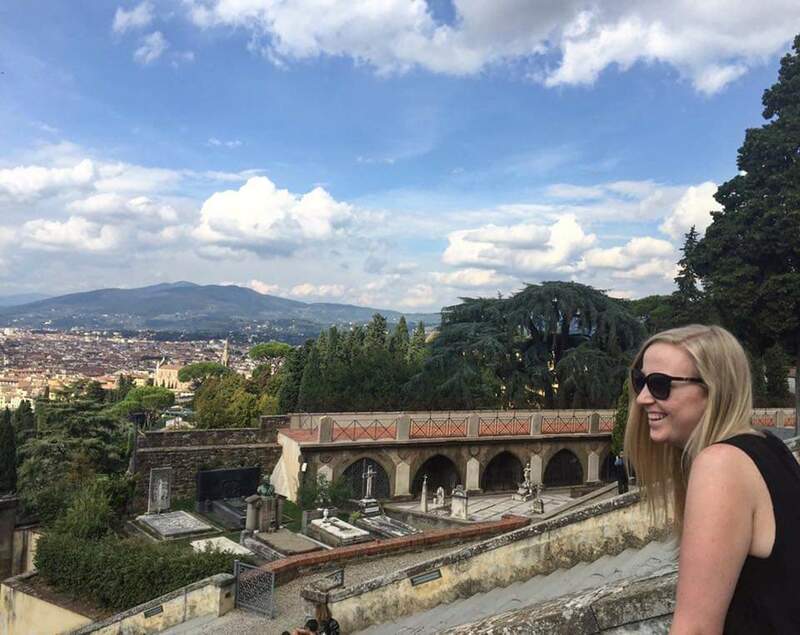 If you are ever in Florence then you must walk up to Piazzale Michelangelo, it's a tourist hot spot, which totally makes sense because the view is breath taking. But I would say, after the walk if you're feeling good then carry on to the church a little further up called Basilica San Miniato al Monte, the view is even better and it's less crowded and more peaceful. It's obvious but the Duomo is by far the most beautiful thing ever, the sheer size of it is so vast you have to lean back to take it all in. It's smack bang in the centre to expect it to be crazy busy but honestly there is nothing more beautiful, during the day, at sunset, at night it always looks good. Unless you want to walk to the top I would suggest not bothering going in because all the beauty is on the outside for sure. So there we have some of my faves! Have you been to Florence or are you going?